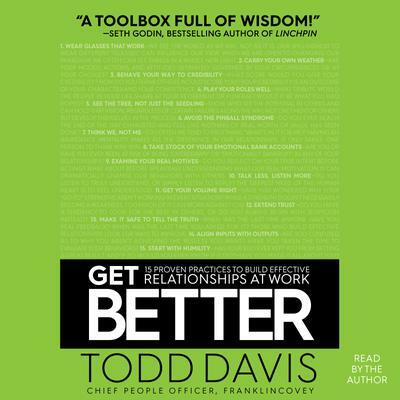 Strengthen relationships and improve communications skills: In Get Better: 15 Proven Practices to Build Effective Relationships at Work, Chief People Officer Todd Davis moves beyond the adage that an organization's greatest assets are its people. Instead, he argues that relationships drive professional and personal effectiveness—and, in the end, create a culture that can become an organization's competitive advantage. Improve your emotional intelligence and become the ideal team player: In an approachable, engaging style, using real-world stories, Davis uncovers the most common relationship pitfalls that hurt careers and negatively affect organizational results. From his experience observing, leading, and coaching others for more than thirty years, David identifies fifteen proven practices that anyone at any level of an organization can apply to be successful at work, improve business results, and truly master effective relationships. -Start with humility, and much more! Master communication, understand your emotions, and build effective relationships with Get Better.